Daniel Ricciardo will start second in Sunday's Singapore Grand Prix for Red Bull Racing. The Australian stunned championship leader Lewis Hamilton by bumping him down to third after Mercedes team-mate Nico Rosberg took pole position. The German was more than half a second ahead of Ricciardo, with Hamilton just four hundredths of a second ahead of Red Bull's Max Verstappen. The Tilbrook team have looked the closest to threatening Mercedes' dominance so far, having topped the timing sheets in FP1 on Friday and being there or thereabouts in the remaining two sessions. “I’m pleased with the front row," said Ricciardo afterwards. "We set ourselves up well and the lap was clean, but obviously Nico created a big gap and I would have loved for him to not be that far ahead. Even with a perfect lap I don’t think we could have caught that up." Singapore provides a similar challenge for the drivers as at Monaco. And after being robbed of victory in the Principality earlier this season, Ricciardo hopes his RB12 can put in a similar performance tomorrow night. 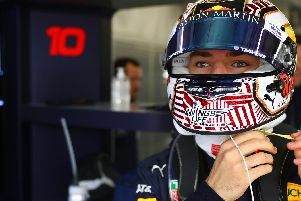 Team-mate Verstappen, despite starting fourth, admits he was frustrated with his performance in qualifying and was left wanting more. He said: "Qualifying wasn’t fantastic and I am disappointed with my starting position. The car felt good throughout the weekend during the practice sessions and I was very comfortable in the car but it didn’t come together for qualifying. "We have good race pace and we also have a different strategy to Mercedes as we start on the supersofts, so we’ll see how it’s going to work out during the race, hopefully we can improve on P4."